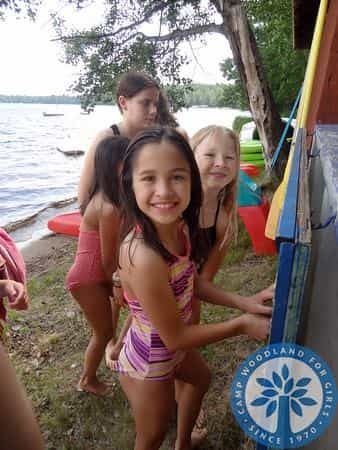 Camp Woodland | Woodland Weekly! Get-to-Know-You Games: After most of the campers have arrived, everyone gets to participate in fun name games and activities that bond the whole camp together! One of the challenges we all get to take on as a camp team is to gather into a cohesive circle based on how many years we’ve been at camp — without talking! Field Games: Our first evening activity as a camp is to participate in field games, which were led by our wonderful counselors Jenny and Sofia this year! SPUD, Buddy Tag, and “I Like Woodland Girls Who” were just a few of the exciting games that the girls got to play this summer. Activity Rotations: On Sunday morning, all of our campers get to go to activity rotations, which gives them a taste of all thirteen of our camp activities! Afterwards, they write down their top six activity choices at lunch so that JoAnne can schedule them for their first session activities! Clue: On Sunday afternoon, our lovely Counselors in Training (CITs) led the whole camp in a riveting game of Clue! Each cabin was responsible for visiting with each “character” and taking a guess at who the “murderer” could be — but only after playing fun circle games! Camp Rec Swims: One of the campers’ favorite things about the first few days of camp is that they get to have all-camp rec swims! The girls had a ton of fun playing on the blue mats, jumping off the yellow raft, and practicing their dives on the diving board! Counselor Campfire: On Sunday night, the counselors performed fun skits and songs for our campers to watch! Our wonderful MCs Roxy Brown (Racquel) and Sally McGriffin (Grace C.) had a blast kicking off the first official campfire of the summer! First Session Activities: On Monday, the campers started the activity schedules that they will keep for the first two weeks of camp! Fun was had by all as the girls jumped from the waterfront to the land sport areas to participate in fun lessons in horseback riding, sailing, archery, gymnastics, tennis, crafts, farm zoo, and so much more! Waterfront fun starts at the buddy board! As you can see, the first few days of camp are packed! Although those beginning activities are super fun, the girls are ready and excited to settle into their normal activity routines! Some special events they have to look forward to are recess games for evening activity this week, CIT-led Fourth of July Games on Sunday, and the Towering Pines/Woodland Red, White & Boom Campfire on the Fourth of July next Monday! Although our initial days at camp have been a blast, we can’t wait to see what the rest of the summer brings!